Copperhill is an amazing farm to table restaurant on the boarder of Queens, NY and Long Island. But before your meal ever comes, they start you off with these pillowy rolls topped with what seems to be an everything bagel sesame mix. My family polished off the entire basket, and asked...or rather, begged for more because apparently asking for seconds was supposed to be a no no. But ever since that day, my mind has been obsessed with these rolls. They were soft, feathery, and buttery on the inside. Beautifully brown and shiny on the outside. I knew they were some kind of enriched brioche dough, but finding a recipe for these was not easy. After a bit of research, I found out that these were Danish Brioche rolls. And when I discovered Trader Joe's sold an everything bagel seasoning mix, it was game on for these buttery dinner rolls! The dough for these rolls is a basic enriched dough made with butter and milk. The interesting part is that you beat the butter in cold. I've always done this with softened butter so that it beats in easier, but the cold butter worked just as well. I love enriched doughs, because they come out sticky and a bit wet, which makes me feel less anxious about having a dry tough roll in the end. This dough is very very soft, so shaping is a bit tricky, but once you get the hang of it, it's a thing of beauty! One tip though, on the second rise after you form the balls cover the balls with either a wet towel or plastic wrap that's been sprayed with a non stick spray. Otherwise, you'll mess up the beautiful tops and risk deflating them when they stick to the cover! Once risen, brush these rolls with an egg wash for that beautiful golden color. I suggest not putting on the bagel seasoning till after they come out of the oven because the dried onions in the mix tend to burn. But once they're out, sprinkle it on with a generous douse of butter and enjoy warm. These are great for a holiday dinner table or just a Sunday night. My kids especially love it with a bowl of hot tomato soup! Dissolve the yeast in half the milk and set aside for 10 minutes. Meanwhile, in the bowl of a stand mixer, combine the flour, powdered sugar, and cardamom. Cut the butter into small pieces and mix with flour. Make a well in the center and pour the diluted yeast and two beaten eggs. Begin to knead, while pouring remaining milk gradually. Knead for a minute and add the salt. Finally, knead on medium speed for 10 minutes, until obtaining a smooth and homogeneous but slightly sticky dough. Cover the bowl with plastic wrap and let the dough rise for one hour in a warm place away from drafts. The dough should double in volume. Line a baking sheet with parchment paper. Dust flour on the countertop and place the dough gently. 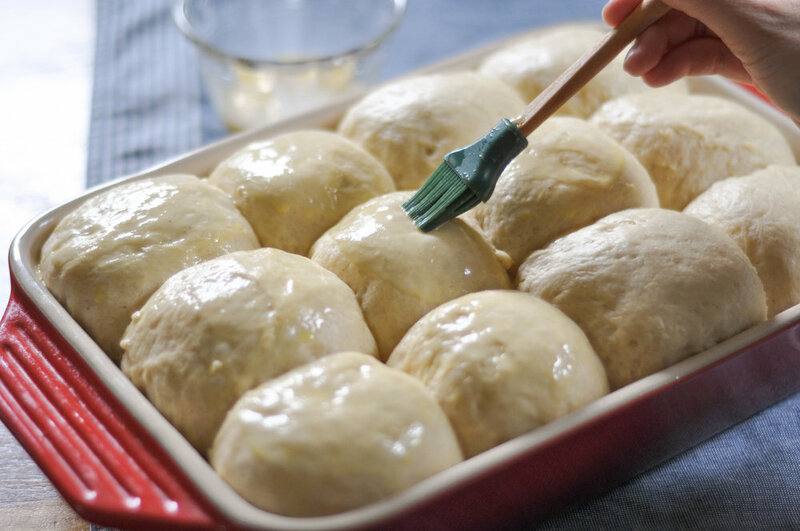 Divide the dough into 16 pieces and form balls. I like to push the dough balls up in between a circle I make with my index finger and thumb to create a nice tight skin. This ensures a beautiful smooth surface to your rolls! Place each ball very close to one another without sticking. Cover with a damp towel of plastic wrap sprayed with a non stick spray and let rise again for about 30 minutes. Preheat convection oven to 400 F. I've done this in both a regular oven and a convetction oven and both came out beautifully. For a regular oven just pre heat to 425F. Mix the egg yolk and milk and brush the rolls. Bake for 15 minutes. Once the rolls come out brush with melted butter and sprinkle with the bagel seasoning. Allow to cool for 10 minutes and serve warm.